Miami broke out with seven goals on Saturday, and its scorers had a combined nine markers this season entering that game. While it’s obviously insane to expect that kind of offense from second-, third- and fourth-line forwards on a regular basis, the RedHawks – at least for one night in a 7-3 win vs. Nebraska-Omaha at Baxter Arena – appeared to be over the forcefield-across-the-threshold-of-the-net blues that plagued them for many of their first 22 contests. The reaction from 800 miles to east, behind a computer screen in a cozy back room, was 50 percent what-in-the-world-is-going-on-but-this-is-awesome and 50 percent it’s-about-time-some-of-those-shots-that-had-been-whistling-just-wide-or-off-posts-the-past-four-months-finally-found-twine. The obvious question no one has the answer to is: Is the drought finally over or was this a three-hour reprieve? Miami entered this weekend 53rd out of 60 in Division I in offense. The RedHawks aren’t that bad. Miami scored seven times on Saturday, and only one of those was by a usual sniping suspect: Anthony Louis. The RedHawks aren’t that good. No team is. The word of the night, and the series, and the past nine days for that matter dating back to the Bowling Green win, is encouraging. Two more words could determine how the rest of this season goes for MU: Secondary scoring. Team leader Jack Roslovic, who had nine tallies this season, has one goal in his last 10 games. Josh Melnick is second overall with six but has one marker in 11 tilts. Miami has still won three straight. This team has seven excellent defensemen and two fantastic goalies. It doesn’t need to lead the NCAA in goals. The RedHawks are now at 2.38 per game, up to 49th, and an average of 3.17 during their current 4-1-1 run. If they can come close to that clip, the back end should take care of the rest, and this could be a fun couple of months. Only once in the past 11 games has Miami allowed more than three goals, so three should be enough most nights. Back to the secondary scoring. Could Kevin Morris could find the net a few more times during the stretch run like he did in both ends of this series? Or is it a reach to suggest that Zach LaValle, who seems to get better every game, could start pumping in the occasional goal? How about an occasion tally – not three a night, obviously – from wide-bodied Conor Lemirande, who showed an ability to use his hands to find the net and was able to tip in a shot while in the goalie’s face (with help from linemate and cousin Andrew Schmit, who picked up primary assists on two of his goals)? The biggest question of this set is Sean Kuraly, since he has the potential to generate the most offense of this group. Can he continue to play at the level he has the last three games, during which he has six points? These don’t seem like outrageous questions to anyone who has seen this team frequently, and if the answer is “yes” to most, that goals-per-game average should continue to improve along with the team’s win total. It was just one game, of course, but that’s on top of two other wins vs. highly-ranked teams, which has to have a confidence carryover for the entire team heading into a crucial four-game homestand and the second half of the NCHC slate. – Miami did get a little sloppy with the big lead and could’ve finished better. Amazingly, the RedHawks were actually outshot overall, 30-27 after netting six goals on 12 shots in the second period. – It was comical that when UNO scored late, the scoreboard operator initially gave the score to Miami, as the top of the screen read 8-2. Force of habit from the previous period, perhaps. – Coach Enrico Blasi’s starting 19 were the same on Saturday as Friday. Evan McCarthy was still listed as the backup goalie. – Speaking of Blasi, let’s give some credit to the coaching staff as well for this mid-season turnaround. 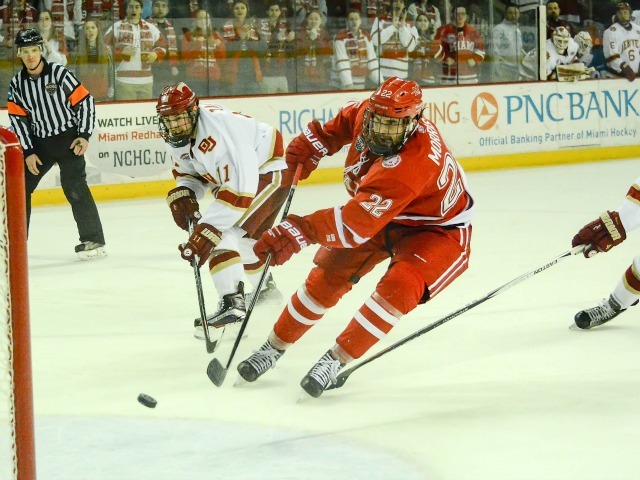 Two weeks ago Miami was 6-11-3 and one point away from the NCHC cellar. Somehow they got this team to turn it around and win a couple of close games, followed by this not-to-close game. 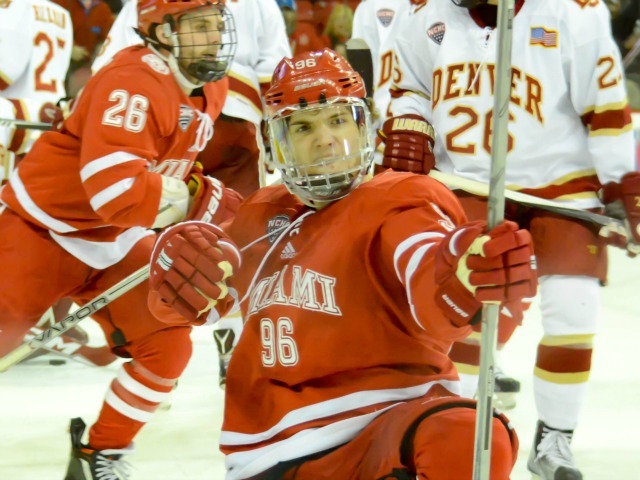 – Segueing again, if Louis doesn’t score with two seconds left to beat Bowling Green last weekend, does Miami go into Omaha Friday and Saturday and pound the seventh-ranked team in Division I back-to-back nights on its own rink? Probably not? 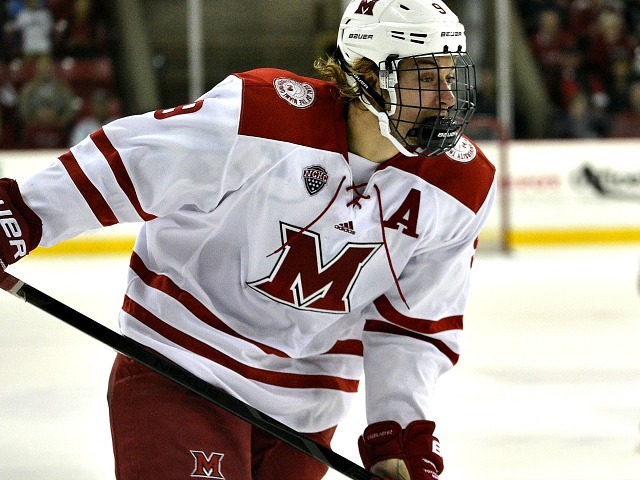 Miami took out a half season of offensive frustrations on Nebraska-Omaha. The RedHawks, who had not scored more than four goals in any game this season, struck for six in the second period alone in a 7-3 win over the No. 7 Mavericks at Baxter Arena on Saturday, completing a series sweep. That extended MU’s winning streak to three games. Miami beat UNO, 3-1 on Friday following a 2-1 victory vs. Bowling Green last weekend. The RedHawks have lost just one of their last six games (4-1-1). 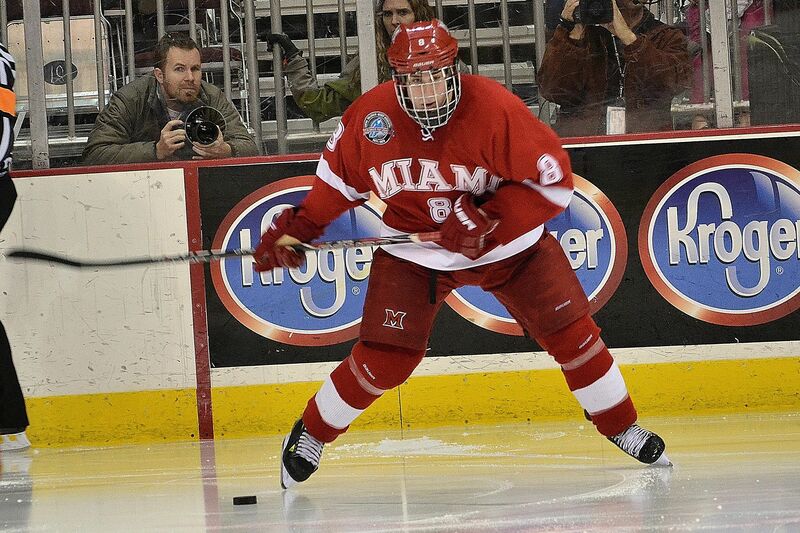 Miami’s Conor Lemirande (photo by Cathy Lachmann). Sophomore forward Conor Lemirande, who had netted one career goal entering this contest, recorded the first Miami hat trick of the season. 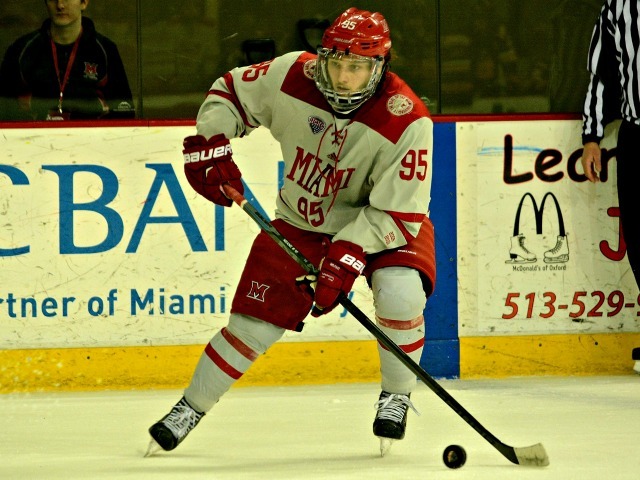 Miami opened the scoring when senior forward Andrew Schmit passed a puck off the boards behind the net, and the carom came to Lemirande, who buried it from the side of the net with 4:02 left in the first period. The net seemed to double in size once the middle stanza began. Senior center Sean Kuraly centered a puck from along the boards to classmate and forward Kevin Morris, who one-timed one home from the slot 42 seconds into that frame. Kuraly made it 3-0 just over two minutes later when he slammed home a one-touch pass from Morris at the inside edge of the faceoff circle. The Mavericks cut the lead to two when Ryan Galt played a puck on net, and when RedHawks senior goalie Jay Williams did not handle it cleanly, Mason Morelli jammed it home with 11:54 left in the period. Lemirande answered, taking a pass from senior forward Alex Gacek from the corner and beating UNO goalie Kirk Thompson on the stick side midway through the period. Lemirande completed his hat trick with 6:58 to play in the frame, tipping home a Schmit shot from the blue line to give Miami a 5-1 lead. The RedHawks would add two more tallies in the next three minutes. Junior forward Anthony Louis ripped a cross-crease pass from Kuraly past Thompson, and Kuraly set up a goal by forward Zach LaValle. Kuraly slid a pass from behind the net to the wide-open freshman in the shot, and LaValle wired it past Thompson on the blocker side to cap off Miami’s scoring. 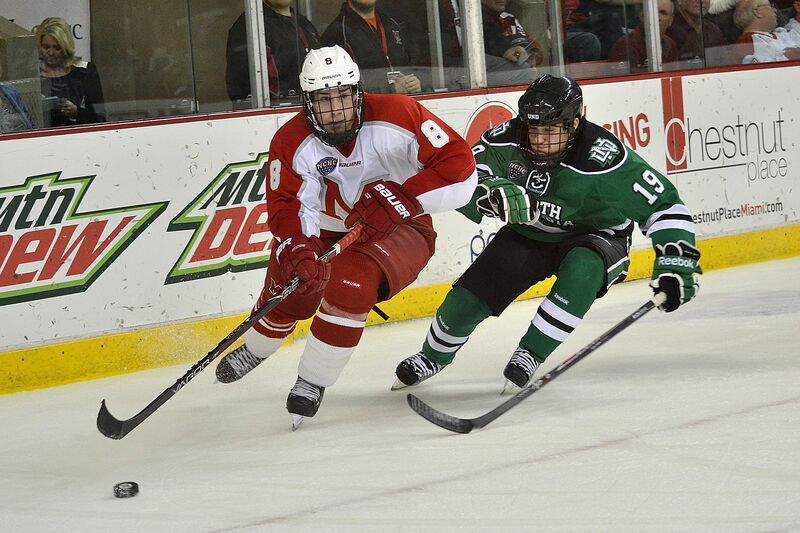 Nebraska-Omaha did add a pair of scores on slap shots from the blue line to cut the final deficit to four. It was the first six-goal period for Miami since Feb. 26, 2010 vs. Ohio State. Kuraly finished with a career-best four points (1-3-4), and his three assists tied a career high. 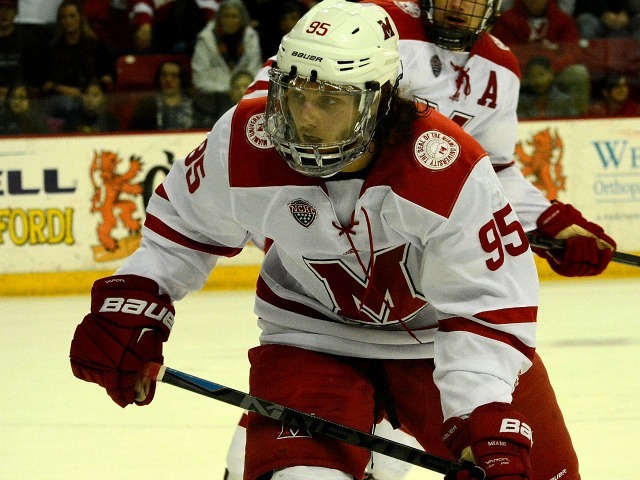 Lemirande became the only active RedHawk with a hat trick in his career. This season, no one on the team had scored more than one goal in any game. In its last six games, Miami has scored 18 second-period goals vs. UNO, including 12 in its last four. The last time the RedHawks netted at least seven goals in a game was Dec. 5, 2014 vs. Nebraska-Omaha in Oxford. Lemirande now has six career points, with four coming against the Mavericks. LaValle finished with a goal and two assists, Morris notched a marker and an assist and Schmit ended the night with a pair of helpers. LaValle had never recorded more than one point in a game, and it was the second career two-point tilt for Schmit. With the three points on Saturday and six for the weekend, MU vaulted Western Michigan and moved into a tie for fifth with UNO at 16 points in the NCHC standings. 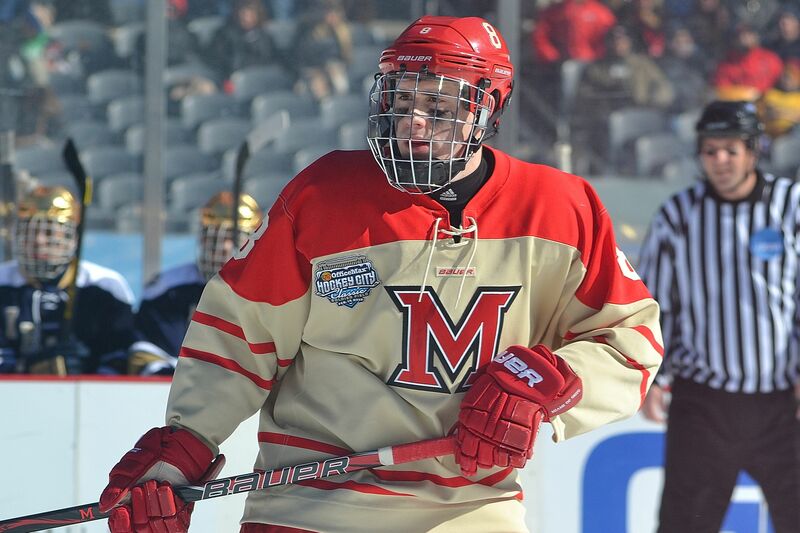 The RedHawks also improved to 20th in the PairWise rankings. Miami opens a four-game homestand with a two-game series vs. Denver on Jan. 29-30. Analysis: Miami thriving late in games? Following Miami’s painful struggles late in games earlier this season, the RedHawks have now pulled off back-to-wins in the closing minutes. The RedHawks beat No. 7 Nebraska-Omaha, 3-1 at Baxter Arena on Friday, thanks largely to senior defenseman Matthew Caito’s one-timer that put MU ahead for good with 2:03 left. Miami also beat Bowling Green on Oxford last weekend on a marker by senior forward Anthony Louis in the final seconds. This game was payback for earlier in the season when the Mavericks stole four points from the RedHawks in the Oxford series. A third-period goal helped UNO earn a tie in the first game of that set, and Nebraska-Omaha took the finale in overtime. Coming out on the wrong side numerous times in the first half of this campaign had two possible outcomes: 1) Crash and burn, let’s try it again next fall, or 2) get stronger, learn how to deal with those situations and start winning. At least in the last seven days, Miami looks like it has chosen the latter. It’s obvious 22 games into this season that this isn’t the 2007-08 RedHawks in terms of talent, or even the 2014-15 team. Miami clearly doesn’t have that kind of offensive firepower. But there’s still plenty of talent there, and the freshmen development – Ryan Siroky, Kiefer Sherwood, Josh Melnick, Grant Hutton, Zach LaValle – has been steady. Jack Roslovic needs to get going again, but he is likely the most talented of all the RedHawks and the smart money is on him heating up again soon. Anthony Louis is doing his annual getting-hot-in-the-second-half thing. Sean Kuraly looks so much better than he did in October when he had the weight of the world on his shoulders. Alex Gacek is having his best season, and it’s fun to watch his supersonic speed. The defense is so good that poor Colin Sullivan – a top six on almost every team in Division I – can’t get into the lineup consistently. Scott Dornbrock, who was maybe the No. 5 or 6 blueliner coming in, has been a rock the last few games, and the three seniors on that corps are playing like Miami seniors should. And let’s not discount goaltending. 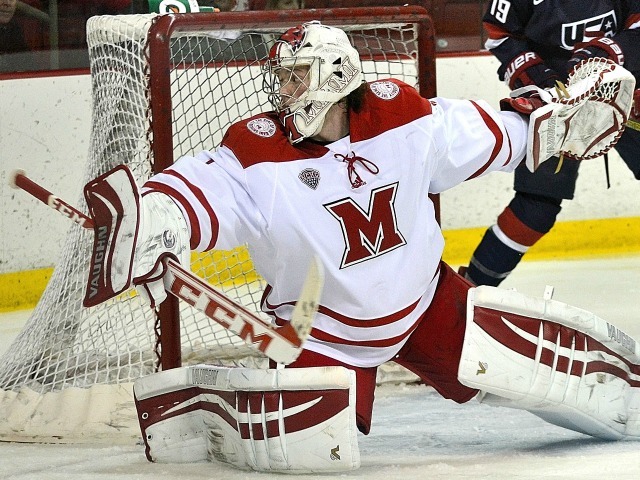 Since the Ryan McKay meltdown, Jay Williams is 2-0 with a 0.80 goals-against average and a .968 save percentage. Not piling on McKay, but all along it looked like this team needed something to fire it up. Perhaps in some way that was it. College seniors like Williams who are in the final stretch run of their amateur careers can do amazing things when given the opportunity. Miami will need to win a lot more games like this: Low-scoring, tight-checking contests against top 10 teams. But for two games at least, the RedHawks appear up for the challenge, and there is still plenty of time for them to get back into NCAA Tournament contention. 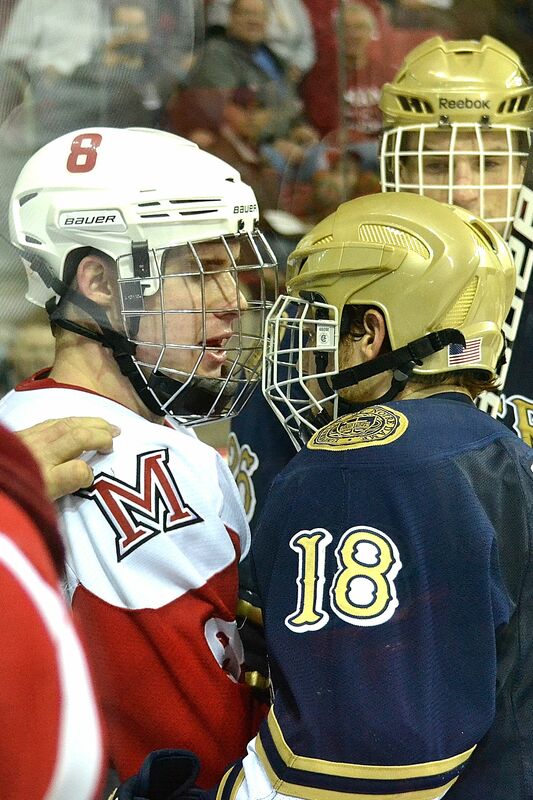 – 76 faceoffs. Yikes. The officials probably have sore jaws from using their whistles. Still too many off-sides and icing violations for late January, and Miami won less than half of those draws. – Overall, Miami has been much better in the third period in recent games. In their last six contests, the RedHawks have outscored opponents, 7-3 in the final stanza. – Speaking of officiating, it was pretty bad both ways. The penalties were inconsistent, and even the announcers were stunned that Zach LaValle’s goal was overturned. For those who didn’t see, LaValle backhanded a loose puck after UNO goalie Zach Blankenburg made an initial save. Blankenburg was sprawled out, and LaValle grazed him with his skate as he addressed the puck, but the goalie was in no way interfered with. – But Miami kept up the surge in that second period, outshooting the Mavericks, 15-6 after an evenly-played, slow-paced first frame. – This game was nationally broadcast on CBS College Sports, but for a brand-new arena that looked beautiful, the in-game camera was way too far away, making it difficult to follow the puck at times even in HD. 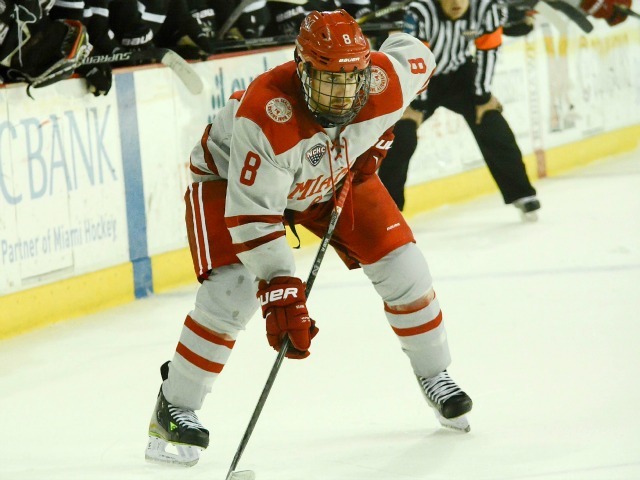 – While Ben Holden and the Starmen do a great job with all college hockey broadcasts – this one being no exception – the lovefest for Austin Ortega was Pat Cannone-esque over the top. And their nickname of California Hot Sauce is a stretch at best. Actually, isn’t the Ortega brand best known for its taco sauce? – Apparently Miami has truly reached the big time, as play-by-play announcer Greg Waddell was picked up from the Omaha airport via limo. FORWARDS: B-. Not a fan of the Roslovic-Justin Greenberg-Sherwood line combination, although it did produce the first goal. For the most part, there’s no chemistry between the trio, and Sherwood scored after seizing a loose puck caused by Greenberg absorbing a hit, which while a good hockey play has nothing to do with players jelling. Roslovic is too good to have his offensive prowess stifled and needs to play on a line that enhances his game instead of hindering it. Liking the Louis-Melnick-Gacek line though. Louis was everywhere in this game, and Melnick had one of his best efforts in recent history as well. Bottom line: They generated two goals – should’ve been three with LaValle’s shot – and one was an empty netter. But the effort was solid, and this corps should be able to continue building from this game. DEFENSEMEN: B. Caito’s game winner was the biggest play of the game. Hutton and Dornbrock stepped up in this one, and the rest of this group played at its usual high level. The double minor to Chris Joyaux did lead to UNO’s lone goal, although the case could’ve been made that it should’ve been coincidentals after the retaliation slashes Joyaux too. But still, this Mavericks team is too potent to get five power plays. GOALTENDING: A+. Here’s where the game was won. Williams stopped 27 of 28 shots, and the one that got by was a rip by one of the top scorers in college hockey on a one-timer off a pass through the slot on the power play. Williams had no chance on it. He made the save of the year with his glove in the first period off a one-timer from right on the doorstep in the first period, shut down another excellent chance off a passing play through the offensive zone and made a big stop after Miami had taken the lead to preserve the win. With Miami’s lack of offense, the pressure on Williams must be intense, and he has stepped up the challenge back-to-back games. LINEUP CHANGES: None. This is about the time of year that Coach Enrico Blasi likes to settle on 18 skaters and stick with it for the most part, and it looks like this is the group he likes for the stretch run. Michael Mooney and Colin Sullivan were scratched for the second straight game, and Devin Loe has not dressed in any of the last four. Ryan McKay also sat again, as third goalie Evan McCarthy remained in the active backup role for the second consecutive tilt. 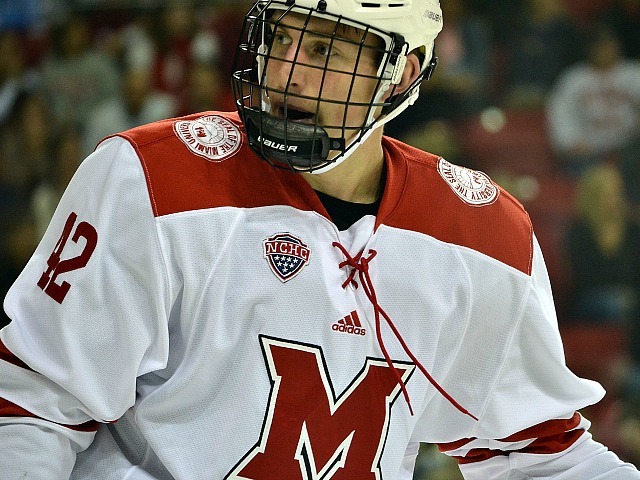 WHO: Miami RedHawks (7-11-3) at No. 7 Nebraska-Omaha Mavericks (15-6-1). WHERE: Baxter Arena, Omaha, Neb.. WHEN: Friday–8:37 p.m.; Saturday–8:07 p.m.
TV: Friday–CBS College Sports (DirecTV Ch. 221); Saturday–None. NEBRASKA-OMAHA RADIO: KZOT-AM (1180), Omaha, Neb..
NOTES: Despite its impressive record, Nebraska-Omaha has lost three of four games, earning a split in North Dakota after getting swept in Denver. The Mavericks are averaging 3.2 goals per game, thanks largely to the tandem of juniors Austin Ortega and Jake Guentzel. Ortega is tied for fifth in college hockey with 17 goals, including seven game winners, and Guentzel in tops in the NCHC with points (11-21-32) and has a plus-17 rating. Justin Parizek and Jake Randolph have added ample secondary scoring, with 21 and 20 points, respectively. Evan Weninger is having an outstanding year in net for UNO, posting a .942 save percentage to go along with a 1.99 goals-against average in 12 games. However, Miami could catch a break, as his status is uncertain after suffering an ankle injury. He did not make the trip to North Dakota last weekend. Kirk Thompson has a 2.93 GAA and a save percentage of .881. 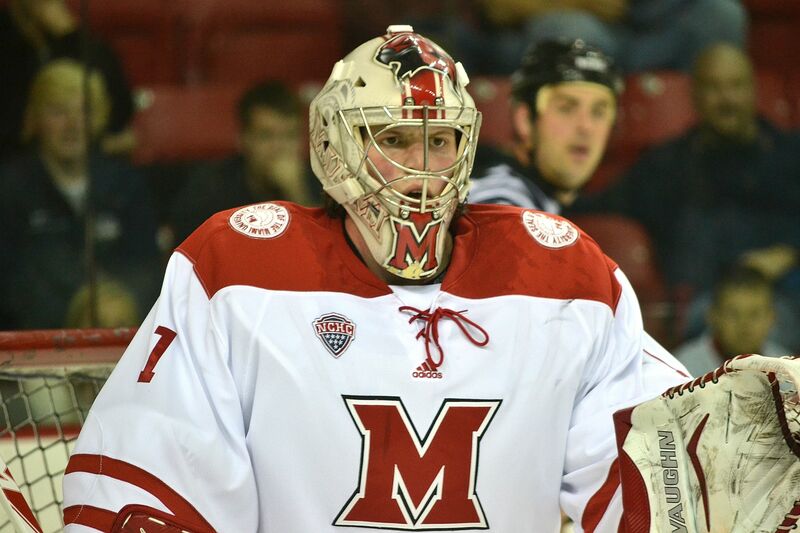 Speaking of goalie issues, the RedHawks’ netminding situation is also unclear after senior Ryan McKay was scratched last weekend. Senior Jay Williams was very good last week in a win over Bowling Green and should play at least one game this weekend. 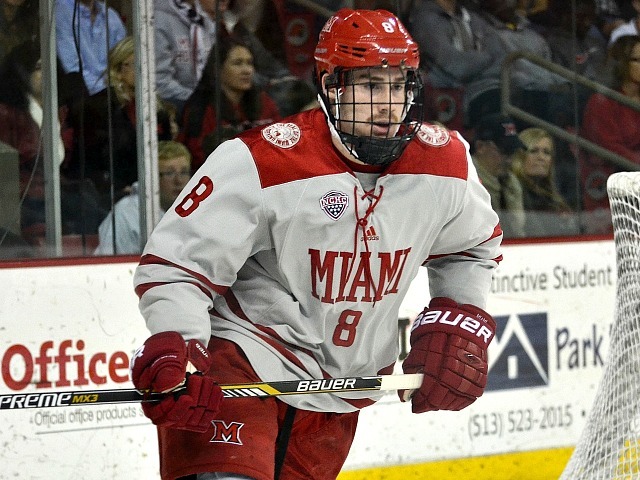 Miami enters this weekend six points behind the fifth-place Mavericks in the NCHC standings. When these teams met earlier this season in Oxford, UNO went 1-0-1, thanks to some late heroics, including an overtime winner in the finale.